The PetSafe Drinkwell Ceramic Avalon fountain has multiple levels for your pet to drink from and creates flowing water for your pet to drink. Cats often don’t get the water they need to stay properly hydrated and getting them to drink from a bowl can be difficult. 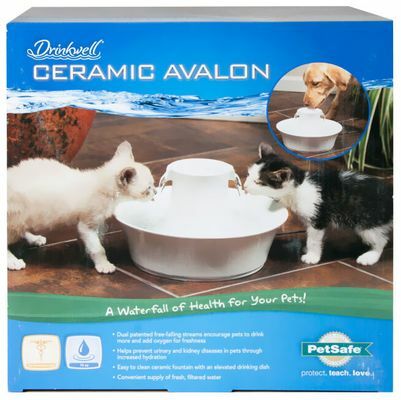 Instead, entice your pet with the PetSafe Drinkwell Ceramic Avalon Fountain. The fountain uses a charcoal filter to clear hair and dirt from the water and makes an excellent drinking source for cats and dogs alike. Together, the filter and water flow work to give your pet a fresh and clean source of up to 70 ounces of water. The Ceramic Avalon Fountain utilizes a round porcelain design to create an easily approachable fountain for your pets. The fountain also adds oxygen to the water through its dual patented free-falling streams to keep the water as fresh as possible. The fountain functions using a 12-V system with a pump that is submersible for silent operation. 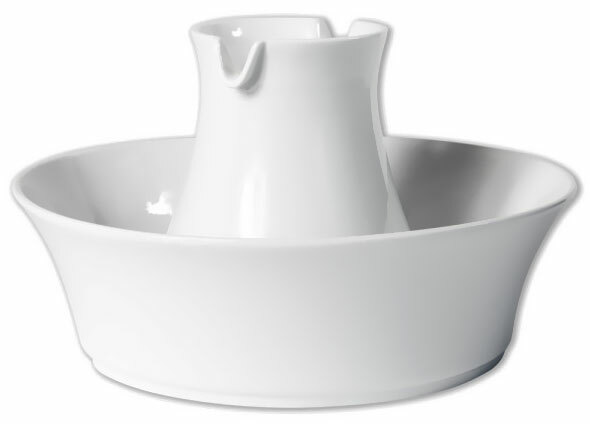 The PetSafe Drinkwell Ceramic Avalon Fountain is easy to assemble and disassemble for cleaning. To clean it, simply remove the pump and place the fountain in the dishwasher for a quick and easy clean. The charcoal filter is replaceable to ensure that your fountain’s water stays clean. In addition to being easy to clean, the porcelain fountain creates a nice aesthetic in the home and is also more hygienic than fountains made from other materials.